No, there aren’t any black bears stalking around in the desert of Tucson. We rented a place in Durango, Colorado, far away from the 115 degree temps back home. I love hearing people in the checkout line at the grocery store complain about the heat here. As I look into things to do here, the connection between fun and fear comes to the foreground. For some of us, the rush from imminent danger—usually in a controlled and relatively safe environment—is a pleasant experience, and that’s supposed to explain why we do some of the crazy things we do. For me, fun doesn’t come from facing physical danger, or if it does, that physical danger had better be entirely fictional. But I wonder how much of my kind of fun involves overcoming fear of another kind—for me, public humiliation, at least on some level. When I think about the sort of things I enjoy doing, there’s almost always a social component, or a creative element to my activity that involves public scrutiny at some point. For instance, if I do artwork, this will eventually be shown. If I cook something besides a grilled cheese sandwich, someone else will eat it too (and my husband is a gourmet…a published gourmet.) If I play guitar, someone will hear it. If I blog…well, you know. My partner is a Pilates instructor and professional ballerina…no pressure or anything. On the other hand, the dancer furthest away from me is 80 years old, and putting my whining self to shame. I am not a dancer by any stretch of the imagination, but recently I’ve been taking flamenco dancing lessons, beginning level. At the end of May we had a recital in which we danced the Sevillanas. This was supposed to be a casual event at the teacher’s house, but eventually became a highly staged performance at a square with 100 rented seats…and that was apparently not enough. The kids had to sit on the floor while others stood around in the back. To make matters worse, we all danced on a set of ‘stages’—platforms really—that were built to protect flooring from the nails in flamenco shoes, and this felt like dancing on a trampoline. Everything went fine for the most part, excepting a shaky moment that apparently no one saw. I can’t say I felt any particular rush of pleasure while dancing in front of an audience. If anything I felt a bit disappointed that I didn’t do as well as I did while practicing in my garage for the month leading up to the performance, but I was happy that I didn’t blank out and forget the steps. I’m not really surprised by this. I tend to derive a great deal of pleasure from the craft side of things, not so much from the performance side. Still, I wouldn’t have practiced as hard as I did without the performance, without knowing things could go wrong. In writing there’s a similar danger that things could go humiliatingly wrong, although this in a time-delayed fashion. Writing is done in a more controlled environment than public performance, but it is a public performance. The act of writing something down renders thoughts empirical, visible, public. In writing, the work is done elsewhere at the author’s leisure, and so expectations can be set higher, and the audience will naturally be less forgiving than they would be in listening to someone give an impromptu speech. These things are on my mind now since I recently submitted a draft of my novel for my writing group. I gave myself an arbitrary deadline—my birthday in May—as a way to get through it, finally, and as a way to remember when I got through it should I look back years from now and wonder what the hell happened. Now I’m waiting for the group to meet again in July to do a critique on the whole thing, beginning to end, and I have to admit I’m nervous. I don’t usually get nervous about writing, but this is different. This is the entire novel. Because my writing group will know what happens and where I’m planning on going with my story, they won’t be able to give me the benefit of the doubt on any particular chapter or scene. This is the real test to see if it all hangs together. Things can go horribly wrong here. The stakes are high, not because I’ll be publicly humiliated, but because I’ve spent a good deal of my life on this…and actually, truth be told, failure at this point would be sort of humiliating because I’ve had plenty of time to get things right. Don’t get me wrong, I know I’ll get useful suggestions for any problems; my group is a god-send. But still, what if the whole story just makes no sense and I have to start over? What if? Could it be that writers are adrenaline junkies of a different, more sedentary breed? Perhaps not the sort to get high on the potential for physical threat, but instead on skirting intellectual disdain from peers? One of the best bits of writing advice I’ve received was this: Take Risks. This advice seems to hit on something true about most bad writing—it’s boring. I know that my best writing tends to come from risk-taking, the kind that makes me highly uncertain of how it’ll go over with an audience. As a writer I’m not too discriminating about forms of praise, but the best comes when there’s a sense that things could’ve gone the other way. That little bit of danger is what makes the praise all the more meaningful. Do you find risk-taking fun? Meaningful? What was the riskiest thing you’ve done? Did you find it rewarding or educational? Can’t say I enjoy taking risks. I often took a lot of them when I was younger out of peer pressure, such as driving fast, participating in fights, riding scary rides, etc. They did provide an adrenaline rush, but as I’ve gotten older, I’ve decided they’re not worth it. Of course, I occasionally take more mundane risks such as taking new jobs and the like, but I now like to know where I’m going to land before I leap. Jared Diamond in his book on traditional societies noted that people in those societies, being very familiar with how people can be hurt, are far more risk averse than we are. He recounts how they refused to camp under trees because occasionally trees fall down. Diamond’s own outlook changed when he got on a transport boat crewed by young and reckless men, and got into a life threatening accident. Notably, one of the natives he talked to afterward had waited for another boat when they saw how the crew was behaving. Diamond realized that he had had the power to mitigate his risk and hadn’t taken it. On writing, one thing I’m learning is not to shy away from showing something because I’m afraid of my ability to do it justice. In science fiction, the risk is that people will find your stuff poorly researched or thought out. But I now find those kinds of mistakes in just about every sci-fi novel I read, which is making me less worried about it. If you’re taking dancing lessons, does that mean you’re feeling better these days? Hope so. Best of luck on the novel critique! I’d try to psych myself that no matter what comes back, I’ll just work the queue, but I know that’s easier said than done. And it pays to remember that some of the critiques will likely represent opinions more than craft issues. It seems like the most consistent quality of those who get published is persistence. That’s an amazing story about the natives not wanting to camp under trees! And I thought I was risk-adverse. It’s also interesting to hear the story of the reckless crew because it’s often true that there are signs of danger that we ignore before something bad happens. Just last night Geordie and I heard some banging noise. I’ve gotten used to looking at Geordie whenever I hear something strange. He’s a lot more aware of everyday sounds and seems to know better than I whether or not something’s amiss. Well, last night he perked up and had his tail straight out for a second, then curled up and went back to his resting position. I didn’t think much of it because I was distracted by the TV. But it turned out to be a sign. My husband went outside and Geordie bolted out the door, which he never does. We had no time to stop him. He was snarling by the apple tree—the same spot where the bear was earlier, but it was too dark to see anything. We both screamed at him to get back inside and, lucky for us, he ran right back in, unharmed. Later my husband noticed that the garbage can had been knocked over, so it was indeed the bear, and that was probably the noise Geordie and I heard. That was the terrier side of Geordie coming out, that totally insane fearlessness when it comes to things he should be afraid of, even though ordinarily he’s afraid of things like the popping sound that a soda bottle makes when it expands and his own reflection in a licked-clean spoon. If I’d thought about his reaction to the sound, I would’ve told my husband to be more careful in opening the door. On writing, I think you probably have the knowledge in most areas that you’d be interested in writing about to have no fear whatsoever in writing Sci-Fi. I know hard Sci-Fi readers can be a tough audience, but you are that audience too, which puts you in a good position. And from what I know of you, your work would definitely be well thought out. On dancing, yes, I am feeling better these days, thanks for asking. I’d started taking the flamenco classes while I was still on this medication that was making my balance worse, and doing the flamenco “finishing turn” was incredibly difficult. The teacher was able to break down something as simple as a turn into steps—kind of a remarkable feat in itself. This helped, but I’d find that doing it in real time would make me lose my balance. I knew this meant things were really bad since this was something that should’ve been fairly easy unless you’re 90 or can’t walk. At the time I wasn’t able to get off this med, but eventually I got on a new morning medication which made it possible to stop the one ruining my balance. The benefit was immediate. Everything felt so much easier, even just moving about in the world. So I’m still taking one medication for the head stuff and it seems to be working pretty well. I’m still seeing this nurse practitioner under the guise of therapy—a benefit I could lose if the Republican health care plan goes through…anyway—and she’s the one who helped me with everything. She’s also the one advised me to do some activity to improve my balance. It had to be something entirely new, something with a social element to make sure I’m put to the task of actually doing it…she suggested something like tennis or golf. Well, I decided flamenco would fit the bill, and it really did. There’s a high level of coordination that people don’t necessarily see because a lot of the work involved is hidden. I didn’t know this when I got into it, but every aspect of flamenco movement is a technique, all the way to your fingertips and your gaze. In fact, while starting out it was more of a mental workout than physical, because of all the little things you have to keep in mind all at once. I’m finding it really helpful for all sorts of little physical ailments, even this obnoxious knot that’s been in my back for so long seems to be going away, so long as I keep it up. Thanks for your encouragement on the novel. I’ll definitely keep in mind that I just need to “work the queue”…breaking things down into smaller tasks is something I need to focus on; it’s a tried and true method. On writing, appreciate the vote of confidence. I showed my nano novel to another person, and their most frequent comments were variations of “would like to actually see this”, indicating that I relegated too much to the background. Something I’ll need to guard against in the future. You have my admiration on mastering the dancing techniques. I can’t dance to save my life. I’ve taken lessons twice, and both times I struggled mightily. If it’s anything more than simple unstructured nightclub dancing, or holding my partner in a slow dance, I’m a disaster. But movement coordination has never been my strong suit. Glad to hear you’re feeling better. I realized when I saw the dance picture that we hadn’t talked about it in a long time. Hope things keep improving, and that the Republicans fail in their attempt to screw people out of those types of benefits. Apparently there’s an abundance of bears around here, and they come here almost daily. Residents know not to leave dogs out for long periods of time. I never leave Geordie out alone at home, so it’s no big deal here either…I just need to be more careful about opening the door at night. On writing, the most frequent criticism I’ve heard—for all writers, and I mean every. single. one.—is, “I want more details.” Which I guess could be another way of saying “don’t relegate things to the background.” So take comfort in knowing you’re in the same boat as all of us, I think. This goes back to taking risks, in a way, because most people are afraid of being boring by including too many details, or by not moving the plot along at a fast pace. It’s hard for us to remember that we’re not making movies. Fast skips in time may be interesting on-screen, but in fiction we’re losing all that specificity and imagery that grounds the reader (in visual media, it’s all already there) and actually taking away from the very thing that fiction does best, which is to slow down time, pull it apart, analyze it, bring out something that the reader has felt subconsciously all along but didn’t realize until now. Also, fiction can delve into inner worlds in a way that movies can’t. Failing to delve into that world—at least in crucial moments—is another common mistake. There’s a guy in my writing group who’s struggled with this very issue for a long while. We kept telling him we didn’t understand his character’s motivation for doing the things he did. This writer has started delving into that inner life and his writing is coming alive and moving forward into serious writer territory by leaps and bounds. On dancing, it’s a struggle for me too, believe me. I think if you had my teacher, you’d be able to make progress without too much frustration. Some people just get it instantaneously after being shown, and others need to be told how each movement needs to be done in a specific way. My instructor can even explain why at certain moments I feel off-balance or uncoordinated, and tells me what I need to do to correct it. I imagine that’s a hard thing to break down through verbal instruction. What sort of dance lessons did you take? Interestingly, my primary frustration with many writers is too *much* detail, at least in terms of description. I actually prefer simpler tighter prose, and my own writing reflects that preference. If people push me for that kind of detail, they’ll be disappointed with my response. But the comments I received were more about showing things like a planet being bombarded instead of learning about it afterward, showing more of the interstellar war that the protagonist only hears about, showing the protagonist’s mind dissection (a crucial plot point) instead of just talking about it before and afterward, and so on. Of course the nano novel was a throwaway practice effort, but receiving that feedback, which feel like valid points, made me realize I need to watch my instincts on this. Inner monologue seems like a tricky beast. Forgoing it definitely gives up one of the main advantages of literary fiction. I know I don’t do enough of it. Another thing I have to watch my instincts on. But I personally think doing too much can bog a story down, particularly if it’s done at the wrong time, such as in the middle of dialog or in an action scene. Of course, a lot of published novels do that, so that’s really more a personal preference on my part. On the movie vs novel thing, one thing I find interesting is reading a book and then watching its movie adaptation (provided the adaptation is reasonably faithful). A lot of stuff that is pieced together after the fact in books have to be shown in real time in movies. Many of the internal conflicts in the Expanse books are externalized in the TV show (sometimes substantially changing the immediate story), which makes sense since a show can’t do inner monologue. The comparison allows you to see the strengths and weaknesses of each form, which is enlightening. On dance lessons, it was pretty basic stuff: ballroom dance and swing if I remember right. I was definitely one of the slowest students in the class. I’m sure if I’d been more interested and willing to invest the extra effort I could have succeeded at it, but dancing didn’t have that much of a draw on me. I know what you mean about long descriptions…I’m generally opposed to them myself, unless they’re done well. I think the best writing is when the details are very specific and well-chosen. It’s much harder to find that one detail that brings the scene to life than to go on and on in some plain objective fashion, as if to catalogue the whole thing. Knowing what to show in scene and what to reflect on can be really tricky. I think we all have problems with that, at least from time to time. It’s really important for storytelling, knowing what to show and what to skip or reveal indirectly. I tend to show everything these days, but a well-done skip can be just as interesting as a full scene. I somewhat subconsciously stumbled upon this ‘well-done skip’ in a story I wrote about a couple in the midst of a fight. The woman has just found out that she’s pregnant after “accidentally” forgetting to take her birth control, even though the couple agreed that they weren’t interested in having children. This whole scene takes place while they’re both putting away groceries, but it’s not exactly understated, and in the end, everything’s a total mess with everything about their future up in the air, including whether or not they’ll have the child. The next scene skips over a period of time and very quickly describes the way the woman feels about her daughter and it’s made clear that the couple is now married. People loved that skip, and it took me a long time to realize why it worked—it put a question in reader’s minds and set up more tension than if I’d shown the two making up. The question becomes: Why did these two make up? How? How can this marriage possibly work out with such a foundation? In truth, at the time I had no idea what I was doing, but just wanted to get on with things. On showing the interstellar war in your novel, it’s one of those things that it’s hard to determine without knowing the themes and points of tension. I tend to find long battle scenes a bit mind-numbing, but I know others don’t. I guess it depends on what the story demands. On the other hand, leaving out the scene that makes up the climax sounds like it couldn’t go well. Do you think you veered away from that scene for a reason? I’m with you on inner dialogue in an action scene. It could slow down the pace if it doesn’t seem meaningful. On the other hand, action doesn’t have to be a separate thing from the inner thoughts of the characters, but we wouldn’t want to hear a long philosophical musing. Have you heard of the scene-sequel plotting technique? I found it really useful, although more for cleaning up the second draft. On movies vs. books, I imagine it would be difficult to relate an inner conflict externally. I find that to be the case in romance, which might be why I find most of the TV and movie stuff unbearable. I like to know why two people have a spark, not just be told someone’s in love. Most of the time we don’t see much reason why, it’s just built on the silly premise of love at first sight. Of course, that doesn’t have to be the case in movies, but getting that connection often entails a lot more work in character development in form of dialogue, and that dialogue had better be good. I think where movies can really excel is in nailing the mood very quickly, and in the use of cinematography to tell a unique story. When I read about what someone looks like, I often think of how unfortunate it is that I’m reading such things. On screen, these introductions are already there for those who like knowing what a character is wearing, etc. That skip you describe does sound very effective. I think it worked because you set up a tension in the first scene, one the reader probably expects will be a thing for a while, and then suddenly resolve it by the nature of the situation after the skip. It’s like a quick unexpected reward. Show, don’t tell is one of the most difficult rules. Wyrd Smyth once pointed out to me that the rule itself comes from film and stage craft, where its meaning is much more obvious and primal, where “show” literally means visually showing. In literature, there appear to be different philosophies about exactly what showing means. Myself, I think it means showing anything that conveys important story information. But what that means depends on the type of story you’re telling. In speculative fiction, there’s something called the MICE quotient, where your story is primarily about either Milieu, Idea, Character, or Events. A Milieu story might spend a lot of time showing things about the world or setting (think the Hobbit and Lord of the Rings books, not the movies), an Idea story showing details of the central idea, a Character story will focus its showing on character developments, and an Event story will primarily show things that are important to the overall events of the story. On space battles, yeah, not everyone is going to find the same thing interesting. I love well described space battles (although they can definitely go on too long), but I remember you not digging the ones in my book. But the other guy I showed it to wanted to see more. (Like me, he’s a sci-fi fan.) But stuff that is mind candy for one reader will often be tedious filler for another. I think this falls under the category of realizing we can’t please everyone and knowing our target audience. On avoiding showing the mind dissection, I suspect I avoided it at the time because how to show it wasn’t immediately obvious and I was in the middle of Nanowrimo and didn’t want to get bogged down in figuring it out. That and I probably wasn’t sure it was showable, but I’ve seen similar things shown in other novels since then, which means I might have just been making excuses for lack of story telling confidence. I’ve definitely heard of the scene-sequel structure. My inclination is to save most of the inner monologue for sequels, say while the POV character is walking to the next scene, or doing some tedious task. Granted, sometimes it’s important for the POV to come to a realization in the midst of the action, but I’ve read stories where every scene was saturated with inner monologue, making the overall narrative feel glacial. On romance and movies, I think movies have a big disadvantage in that they have very limited time. To me (as admittedly a non-romance expert), this makes showing any realistic romance from start to finish difficult, particularly when the movie isn’t primarily about the romance. Novels and TV shows both have it easier, since they can take time to show the relationship slowly building over time. I often think movies that aren’t romances would be best served by having the romance already established, or having it almost but not quite developed yet at the beginning of the movie. I had no idea that “show don’t tell” originated in film and stage craft. That makes more sense now. I’ve always found that to be a very strange bit of advice for writing novels since it does seem so visual. Actually, I thought it came from a trend to emulate film. On the MICE quotient, I’d probably say I’d be more interested in IC than the ME. As you say, everyone has a different cup of tea. On skipping the mind dissection, I’m pretty sure you’re not alone in not wanting to tackle something like that. And Nanowrimo can have that effect. Agreed on too much sequel, not enough scene. That’s probably one of my biggest problems in writing. I tend to be too reflective, which I’m starting to realize is boring no matter how amazing my thoughts may seem while I’m writing them. Somehow when I’m reading or watching other people’s stories, I get picky about needing more forward-moving scene, but when it comes to my own I don’t seem to have the same standards. Still working on that one. The scene-sequel thing really helped a lot. I had a bit of an ‘ah-ha’ moment when I applied that scheme to my second draft. I was able to quickly cut and move things around to improve the pacing. I love plot advice and schemes and diagrams. I need that more than anything, as I tend to get lost and disorganized. When the movie isn’t primarily about romance, that’s usually when I get annoyed with the romance, especially if it’s given a big chunk of the story as a subplot. I’d rather not have it to be honest. But it’s a tried and true formula and most people love that sort of thing, so it’s not going anywhere. In movies you can tell when the romance subplot is about to happen just by the appearance of a new character even before you have any real reason to suspect it, and that irritates me. I’ve come to love a story that seems like it could have a romance subplot, but doesn’t. Jane Austen is probably my favorite writer to deal with romance, but she’s actually fairly realistic when it comes to making sense of why people fall in love and doesn’t shy away from being pragmatic about it, perhaps even a wee bit moralizing (which I admire in her case). Sense wins over sensibility, and sometimes the protagonist finds out that love at first sight can’t be trusted. On inner monologue, that also feels like a target audience thing to me. I find lots of inner monologue tedious, but just like you with space battles, there are lots of people who really enjoy inner monologue. Many of the books I struggle with because of it seem very popular exactly because they have it. I think there’s a lot to be said for writing the story we ourselves would like to read. In my case that includes space battles, in yours, maybe a good amount of inner monologue. I suspect we both might be robbing our stories of some spirit if we curtail our impulses too much in these areas. I know what you mean about leaving out the romances in movies. I can’t resist looking at an example in the Star Wars movies. I think everyone would agree that the romance between Anakin and Padme in Attack of the Clones is one of the most wretched in movie history. The movie would have been better without it (not that that was its only flaw), perhaps with them already being in a relationship at the beginning of the movie, or on the cusp of one where the transition might have made more sense in the fast paced story, as Han and Leia were at the beginning of The Empire Strikes Back. If Lucas wanted to do a full ramp up romance, he should have made the whole movie about it, although that wouldn’t have appealed to standard Star Wars audiences. I so agree. And really nothing is off-limits. Whatever moves you in a real and authentic way is likely to work, at least with some people. Although I’d wager that if you find it exciting and take risks with it to communicate what it is that excites you, you might find that people who don’t like the standard fight scene or battle will take interest. I’ve been surprised before by things I generally don’t enjoy. There have even been a few TV shows with such incredibly well-done combat scenes that I can’t wait to get to the next one. One show (I can’t remember the title now) even had me wondering if I actually just don’t like confusing war battles with too many players and short clips of action. It could very well be that I don’t like confusing clips of action, but instead would like for a story to be told in the battle itself. And I could do without gratuitous gore. On Jane Austen, I haven’t seen very many of the movies or spin-offs so I don’t know what those are like, but I’ve read all of her novels. Sense and Sensibility is probably my favorite. There’s something about her style of writing and her keen observations that can’t be matched, and that really carries readers, even when they might not really care about the subject matter in itself (I certainly didn’t). I think she was probably trying to speak to the young women of her time to teach the sort of life lessons that would apply to them. I’ve been amazed by the feminist interest in her work because she never struck me as particularly feminist. Actually, she seemed to me to be a traditionalist in many ways, and her free-spirited characters—the same ones who would be lauded in most generic romance novels—are generally given a big reality check. On the other hand, in many of her novels there’s not just a strong romantic element, but a criticism of society and certain personality types and the way young women are taught to think about marriage and love. She tries to correct that by encouraging women to be reasonable and clear headed, and this can take on more forms than I ever would’ve imagined. The endings of some of her novels can be almost surprising—probably because she breaks from the paradigm—and even disappointing at first, but they usually offer something to think about. At least that’s what I found to be the case a long time ago when I read her works. If you think about what women’s lives consisted of back then, she really was doing a them big service. If you’re a woman in those times, you’re supposed to decide on a spouse with whom you’ll spend the rest of your life, decide whose advice matters to you and whether your parents know what’s best, decide your social status, your lifestyle, your connections…and whatever you choose in this time in your life is what you’re stuck with pretty much forever, and this at an age when you’re likely to be concerned with really silly stuff. I think you hit the nail on the head here. Battle scenes in fiction need to tell a story, and the descriptions of them should be clear enough that a casual reader feels the suspense and understands what each development means. That can be difficult to do, and I know I’ve gotten hopelessly confused before and ended up reading just to get past the battle, maybe watching how the characters reacted to see what each development meant. I don’t enjoy reading those. For movies and TV, my attitude is that confusing combat scenes are usually confusing to obscure low production values, crappy choreography, poor special effects, etc. A book or movie doesn’t have to do into details on a battle, but if they’re don’t, the battle’s portrayal should be brief. For space battles, it can very hard to keep the description clear for readers who aren’t familiar with the terminology. Phrases like “10g burn”, “coming from stellar north”, “firing counter measures” all mean something to an experienced space opera fan, but are probably gobbledygook for new sci-fi readers. The trick for authors is to introduce these gradually enough that new readers can pick them up by context. But even as a long time space opera fan, I sometimes get lost in the terminology. Austen’s world sounds pretty unforgiving. Is her stuff all about the nobility, or does she ever cover anything about commoners? I ask because I know if you go back far enough, decisions about who the nobility married weren’t left to the younger person themselves, but was often handled by their parents, for better or worse. Jane Austen, I think, wrote about her own class—the gentry—but that included both people with vast wealth and what we might call the middle class. It’s really like discovering a microcosm of social status within this realm. A lot of the detail here is lost on me, I’m sure. As for marriage, it’s true that the parents have a big say in the matter, but in her novels they aren’t usually authoritarian about it, at least not in the way we might think. That’s actually a big theme throughout her stories, the balancing act of strict parenting and letting children choose their own destinies. This aspect is very relatable even today. For the most part the heroine seems free to choose, but what makes this interesting is that the stakes were higher back then. For her, there’s a lot to consider, especially family dynamics (what happens to the sister, for example, how far away will she be? ), social status and the like, things we don’t consider nearly as important today. Wealth is a pretty important factor for her, and it’s not a bad thing to admire someone’s wealth, all else being equal. This seems especially relevant in her time since women really had no wealth of their own and their marriage would determine a lot for their family as well as themselves. Austen sometimes depicts situations in which defying parents or marrying for love (below one’s social status) can be a good thing, though these situations seem rare. For her, it really depends on the details, the character of the characters. She’s not dogmatic, which is why her stories feel so realistic and interesting. I am very risk averse. I don’t like motorcycles, rollercoasters, gambling, or really anything that creates an adrenaline rush. To me it is not a pleasant sensation. On the other hand, I understand the public scrutiny thing and its element of risk. When I started writing, I was conflicted between the need to write as a self-expression and even a kind of therapy, and the desire to share it and receive some kind of feedback and (hopefully) approval. But with sharing comes the likelihood of suggestions for change and “improvement” based on what would meet the aesthetic standards of other people. I did end up sharing my writing, by self-publishing and on a blog, but that is not as important to me now. I want to write more, but for me the public part will always be secondary. My most important audience is myself and the best part of writing is the experience of doing it, that “flow” experience of total absorption. I would be scared by the presence of a baby bear, because I’d assume that momma bear is nearby!! I like your Jared Diamond story. I saw him give a talk once and he’s a great speaker. I know what you mean about the flow experience…that’s most of what I’m after when I write these days. For me the hardest part of finding that balance between self-expression and audience is at the beginning of starting something new, like this blog. Once I know my audience, literally, it seems easier to write for myself because of the trust that builds up over time with readers. On this blog, I don’t write for some vague audience, but instead specific people like you. That gives me a lot of freedom to write whatever strikes my fancy, and actually improves the writing itself. If I write something more technical, I know you and the other regular commenters won’t shy away (or even find it all that technical or difficult), and any criticism I get will be thoughtful and worthy of taking seriously. Blogging is probably the best gratification for me, not only for being instantaneous, but also for having such a highly intelligent group of people to write for. On writing the novel, I tend to write that more for myself—for the flow experience—than any other form of writing. That involves a lot of introspection and creativity, and the ‘performance’ comes when I submit to my writing group. There again I have the benefit of having a specific audience, except everyone in that situation is thinking of a general audience, which has a peculiar effect. I’m not writing for the group, per se, but for their opinion on writing for a general audience. On the other hand, I know their biases when it comes to craft and so I can keep that in mind when I hear their critiques. In our group we all know that we have our biases and things are done with a light touch for the most part, especially when there’s no consensus on some matter. On the baby bear, yes, I was scared of that. I still haven’t seen the mother, but she must be around. Yes, I’ve been amazed and touched to see how supportive the blogging community has been for fiction. I’ve never been trolled but instead have received thoughtful comments and encouragement. Still, I notice that blogging has reduced my fiction output dramatically because I’m writing short nonfiction posts and enjoying the quick gratification of online interaction in place of the more demanding and interior task of writing a long piece of fiction. So at some point I’m going to have to take a “blog-cation” in order to make progress. I feel so lucky too! When I started blogging, I was so worried about nasty comments, but I guess I haven’t gotten big enough to invite such a wide assortment of people. I’m glad for that. I know what you mean about wanting to blog instead of write fiction. I went through a long period of that, but recently took my “blog-cation”…it’s a good thing. I highly recommend it. Now that I’m on an actual vacation, I’m coming back to blogging, almost as a reward. I am flattered that your husband is reading my book (that one is really a set of short stories). I hope he doesn’t expect a lot of philosophical content, based on the title. It’s a bit of a bait and switch that way. I used the term more as a metaphor for a situation where highly intellectual people are falling in lust! But yes, I do feel complimented. Please give him my thanks. You’re right about risk and writing. Putting out a blog post carries a relatively small risk, but presenting or publishing a full-length novel is mightily threatening to those of us who are introspective and thin-skinned. You need to choose carefully which voices to listen to. Having published a novel and received some highly negative reviews on Amazon, I think that unfiltered reviews can be very harmful, and it’s probably best never to read ANY reviews from general readers. The only benefit you (might) get from them is learning if there are common issues with your book that present difficulties to certain kinds of readers. You can use those lessons for your next book. When you give a novel to a writing group or a reviewer that you trust, a big part of you just wants to receive praise. You have to suppress that part of you, as it’s setting you up for disappointment, and praise alone won’t teach you how to improve your novel. Instead assume that your reviewers can help you to make your novel better, and hope for helpful criticism, rather than praise. No novel is perfect, especially if it has yet to be reviewed. A good reviewer will give you useful feedback, but as you say everyone has their biases. My advice would be to look for commonalities in the feedback, and try to read between the lines. Sometimes people will say different things, but might be pointing to the same underlying problem. If a couple of people point to the same problem, it’s probably real. But never take it personally. Reviewers are not criticizing you, or even your ideas, just the words on the page, and you can change those words. You can change the ideas too, if necessary. You can even change yourself, and writing is surely a journey, however painful. Take risks, yeah. It makes you feel alive. Good luck! Thanks for your advice! That point about finding commonalities in the feedback is SO TRUE. It’s actually incredible that there are such commonalities almost every time I submit something. I noticed this when I took a writing class and found out that almost everyone pointed out the same passages to remark on, even when they said different things about them. That’s really useful stuff. If the comments are mostly negative on some specific thing, there’s probably something fishy going on there, even if it’s not exactly what readers are pinpointing as the problem. Just the fact that they’re paying so much attention to it means it’s worth looking into. I have yet to publish any fiction, and I imagine it would be terrifying to read those negative reviews, especially if they’re mindless and worthless. Most definitely more terrifying than hearing any criticism from my writing group, even though I know their comments will be constructive. How strange that is, to be worried about an opinion that doesn’t matter! I’ll keep your advice in mind should I find myself in that situation. Thanks Tina, this is an interesting read for me. I’ve been doing some fiction writing myself this past four months, and with the intention of producing a long-form piece — 60k-80k words. I have four (what I call) beta-readers, who get submitted each chapter once I’m happy with a draft. Two of the readers are more helpful in that they focus on what jarred for them, so I get a feel for how others’ minds are receiving the words. What I’ve found is that at least half the criticism is about expressions of preferences as to how things should be, and I find myself doing the very same thing when critiquing their work in turn. It’s still useful, because it demonstrates the flow, or lack of it, in others’ minds; but I’ve come to the conclusion that you just have to accept a degree of this. I’d be more concerned if all four came back with nothing more than notes of approval. The acid test will come when I have to do what you’re doing, and submit the whole thing for feedback prior to editing. I can see me putting up an almighty fight, being the terrible autocrat I am. Have you heard of SPOT theory? — Spontaneous Preference For Own Theories. I think this comes into a play a bit when you ask other writers to assess your work. By the way, I’ve just read Mrs Dalloway, which has depressed me no end, it’s so untouchably, frighteningly good. Do you think it’s a good idea to read lots whilst in the writing process? I’m glad to hear you’re working on some fiction writing! What’s it about? Are you in a writing group now? As for the SPOT problem, there’s a terrific solution for that in a face-to-face group format. In my writing class at the local community college we were told that when we’re being critiqued, we’re not allowed to speak. At all. First the group summarizes the submission on their own, then they do the critique (what works first, then what didn’t work), and if they get things wrong about what happened, you can’t point that out to them. Your job is to take it all in, even when it comes to basic plot details that might seem obvious and clear. It’s a tough thing to do for some people, but I see this author silence as crucial. You might find that you learn a great deal from listening to the group hash things out as if they were in a book club discussing your work while you’re just a fly on the wall. A quiet fly. That’s a bit harder to do in a non-face-to-face group, of course. On reading while writing, I don’t have any strong preferences on that issue. I can see it both ways. I like to read a diverse collection of books while I write, but not in any systematic or intended way. While I’m in the process of writing, I tend to take on tricks that I admire in other’s writing, so I try to watch myself on that and make sure that the techniques I’m stealing are appropriate for my own work. I don’t know if that’s working out for me. It might be better for some people (and perhaps for me) to just avoid the influence altogether. I’ve considered that…just haven’t decided how I feel about it. I don’t get discouraged over great writing, but instead I study the hell out of it and sometimes get too involved in stealing techniques. Sometimes those help, sometimes they get in the way. What do you think? Have you noticed that you find yourself influenced? On Mrs. Dalloway, I actually started reading that for a book club, but I couldn’t stand it. To be fair, I didn’t even come close to finishing it, but the confusion and lack of a clear plot didn’t work for me. I guess. Whatever it was, I just couldn’t get a foothold. On that note, I enjoyed reading Infinite Jest even though based on all I’ve said above I shouldn’t have liked it. While I worked on my novel I could sense some of those techniques creeping in, but I thought it helped. I hope it did. Crossing my fingers. If you’re on the lookout for some amusing or crazy techniques, check that one out. My God that was creative. “. . . we were told that when we’re being critiqued, we’re not allowed to speak. At all.” Have you thought about taking a gun? “Have you noticed that you find yourself influenced?” It’s bound to happen if we’re not inhabiting the narrator’s voice fully, I guess, if we’re not virtually become that person? So, if that happens, then I suppose it points up a big problem in that we’re not settled on who’s narrating? But yes, like you, I have to watch out for that, ask if the voice is the voice it’s supposed to be. Reading Woolf, say, then it’s easy to get sucked into disjunctive syntax, for example, become like a thesaurus of synonyms for the one adjective that’s actually necessary. “Are you in a writing group now?” Only the virtual one I first mentioned: a guy over there in Maine who’s doing very well in getting short stories published, and a woman over here in Manchester, plus two others who are never critical and therefore not that helpful other than in terms of support and encouragement. I’m going to send the chap from Maine here to look at this post of yours. I’m a hopeless autocrat, Tina, like I said, but still I find parts of the feedback extremely helpful. Hopefully, they’ll remain good at dodging bullets, those two who tell me where I’m going wrong. “What’s it about?” A polyamorous triangle who unwittingly get embroiled in an art fraud. It’s narrated by one of the three in 2020 looking back to events between 1989 and 2010 when the triangle was still in place. He’s now (in 2020) in the early stages of what may be, so he’s told, dementia. Another of the three, the female who’s an artist, edits and completes the story. It’s metafictional, so as much about the narrator outside the story as the events he’s narrating within it. It’s going to sell millions; there’ll be film rights too, of course. P.S. That’s amazing to me, what you say about Mrs Dalloway, but it just goes to show how wildly divergent the views of any two readers can be, even two who are sort of on the same wavelength on a lot of stuff (I think). I’d be happy to beta read, if you’d like. On the virtual writing group, maybe the supportive critiques can be useful if they’re at all specific on what works? I know with my writing group, we’ve come to trust each other so much that we often joke that we’d rather just get to the negative stuff and skip the positive (not the best language here, but you know what I mean—”What Works” vs. “What Could Use Improvement”). But the positive stuff can actually be meaningful, especially if there’s a consensus or a pattern, as Steve pointed out in one of the comments here. When everyone seems to love something in particular, you can get some sense of how to rework those other parts that didn’t get any comments, or that got negative attention. On being a hopeless autocrat, I know, I know. I think we all are, but no guns allowed! Only a kitchen timer to get people to stop chit-chatting. It’s a bit of a passive-agressive scheme to round up the herd, a great trick for a non-leader who’s surrounded by a certain non-stereotypical, super-loquacious type of writer. Instead of shouting, “Shut up everyone we’re doing a critique now,” I just quietly say, “I’m setting the timer.” Then the ticking sets in and everyone knows it’s Time. Thanks for sending the chap from Maine! I’m going to speak with him right now. “Having the other non-demented character’s POV will help the reader get a grasp on what really happens.” — I bloody well hope so, Tina. Hahahahaha! No, the narrator has perfectly lucid spells in which he writes from time to time, and he’s at that incipient stage when short-term memory is problematic, but he can still function with sticky notes and living within a controlled environment and lifestyle. As you probably know, there’s a stage in incipient dementia when the subject is aware that they’re ‘losing their mind’ (as someone I know once put it to me), but can still carry on everyday living in a limited fashion. He has flashes of dissociation, fugue-like episodes and with a paranoia which scares the hell out of him, but can reflect back on them objectively. He sundowns each day, and writes only before then, and only on his ‘good’ days. I think that’s a viable scenario; didn’t Terry Pratchett do something like that? And also the bloke from Monty Python, Terry Jones? Thank you so much for your kind and generous offer to beta-read! I’d love you to do that, if you would, though perhaps once I’m a little more advanced into the thing. Dear Michael and the good lady in Manchester are proving invaluable in helping me see the ragged edges of each chapter as we go, but one problem we’re experiencing is in the more casual references — soubriquets, quirks, passing remarks seemingly innocently made, that sort of thing — being forgotten in part due to the lag between chapter readings. I currently have five chapters of between 5k and 6k words apiece, and seem to be completing one every 3 or 4 weeks. So, if the narrator makes a passing reference to something minor that was mentioned 2 or 3 chapters ago, my beta readers are at times struggling to recall it. Listen, I’ll email you a PDF of a sample chapter, if I may, but a little later put a few together if you think you can bear it. No obligations whatsoever, naturally, and if you can’t bear it at all, just pipe up. Thank you, Tina! The story your talking about, we’re still with Isaac, by the sound of it, yes? I get what you mean about the supportive critiques, and I’m thinking in particular of when someone in the story’s made what I think is a witty remark, and it’s good to have it confirmed that it hasn’t fallen flat. You’re absolutely brilliant at that (being witty), from what I read of your early drafts of TPK, and it’s something I’m trying to have just a smidgen of in my own current effort — a smidgen being all I’m capable of, in truth. I’m making quite a few references to turns of phrase, regional English habits and traits, that Michael in Maine isn’t familiar with, but he’s assured me I ought keep them in place, and that’s a relief. Does everything have to be understood? I don’t think so. Sometimes the feel is more important than the meaning, perhaps? Dunno. Anyway, I’m not writing with any grand plan in mind for an international readership, see if I can creep into the top five million on Amazon, or anything; it’s more what Esme Cloud is pointing to below about going through the creative process as an end in itself and as a means of personal fulfilment. I’ve rather lost interest in the blogging thing, the short-form writing, since taking up this fiction malarkey, and it is tremendous fun, but challenging, by heck, it’s challenging. My story, which I didn’t mention above, stands in relation to a real-world art theft from the Museum of Modern Art in Paris, in 2010. The fallout from that ensnared my fictional characters of the love triangle, hence the ‘unwitting’ element of the art fraud business I mentioned. And then one of the three of them, the one who’s narrating the whole caboodle, has dementia! Hahahahaha! Talk about making life easy for yourself, eh? I don’t know Tina, it feels like I’ll get to the end, but it’s by no means a certainty. I’m giving myself at the very least a whole year on this, unlike the 13 weeks I gave myself for the meditation manual I did, so there’s a chance I’ll make it to the end. But then everyone thinks that, right? Yes, send it! I’m going to be traveling back home tomorrow, so it might be a little while before I get to it, but I will. On dementia, you could go with what my mother had, which was Lewy bodies. That meant she still had the ability to figure out what was going on in front of her, but she’d forget what happened five minutes ago. But you never knew what she’d remember and what she wouldn’t. Plus, there’s an interesting thing about Lewy bodies…they start off with hallucinations that usually involve a small critter like a bird a or a squirrel. When I found out about that I was amazed since my mom thought there was a bird flying around in our living room. I didn’t realize at the time that that was a sign of a specific form of dementia. Later, she stopped hallucinating. On regional turns of phrase, I’m with Michael, keep it. Sometimes with obscure references I try to give a bit of an explanation in some unobtrusive way, but that all depends on what’s going on in the story and how it’s done, etc. One year? That’s all? I’ve been doing my novel for so long I can’t remember when I started. And yeah, still with Isaac. And Alexandra, the crazy one. I’ve changed the title to “A Footnote to Plato” instead of “Philosopher King” since my novel is really about the life of an academic and his comparatively small legacy. Lewy Body Dementia, yes, it could be. As I understand it, dementia sufferers in the main are not diagnosed specifically, as without an autopsy it can’t be told whether it was vascular or AD, or perhaps Lewy Body; although the latter has particular characteristics of the motor system, I think — stiff movement, perhaps with falling occurrences, yes? Those are besides the hallucinatory animations of the inanimate, that you mention, which I knew was also a characteristic of LBD. I think LBD tends to strike in older people too, the over-65s, and Ray, my narrator, is 65 and has had problems for a year or two. I’ve had quite a lot of experience of being around people with advanced AD, and besides that am sure I’m correct in suggesting that in the incipient phases the early symptoms come and go, yet with the daily ‘sundowning’ effect I mentioned. Anyway, it’s a dynamic in the story that’s entirely feasible, especially given the narrator/author is writing over a fairly limited timeframe in which there isn’t massive deterioration. I want Ray to feel and to be confined, and to be anxious within all that. He’s fearful of his tentative medical prognosis, and he’s fearful of the art fraud he’s unwittingly embroiled in. I think that’s quite a good dynamic that propels him into his memoir, best as he can account for it, even though he’s far from being a writer by his own admission. A Footnote to Plato. Okay then! That’s almost sounding like one of our veiled English puns, given that feet are ‘plates’ — i.e. rhyming slang, ‘plates of meat’? Mine’s provisionally called Beggar So Queer, which is an anagram of Georges Braque, who’s a central element of the story. Ray, the narrator, has trouble getting to sleep, so he lies on his bed staring at the ceiling in the dark creating anagrams. All the chapter titles are his anagrams too. Neat! I like the anagram idea for chapter titles. I’m glad you told me about it, because I’m sure I would’ve missed that. I’m the chap from Maine Hariod mentioned above. It has been a great deal of fun to preview Hariod’s work, and I have way too much respect for him to offer anything but the very best criticism I can muster. Thankfully there is a very large sea between the two of us, filled with carnivorous fish. I do find that trying to read critically is very helpful, and even though I know my criticism is novice in its own right, we simply have to walk the path, one step at a time don’t we? Congratulations on finishing a novel! I think that is a monumental accomplishment in and of itself. The existence of Barnes and Noble is altogether misleading: it is not at all easy to write a novel. I know because I’ve written a bad one, and that alone was an arduous task. The good news is I’ve made peace with editing. (To a certain extent.) Even though writers have the luxury of writing when and where they choose, as you noted, I don’t find that helps much! There is a point where time and space have diminishing returns and I feel like we have to just write and write and write until we wear down or exhaust all the bad habits and self-indulgent tendencies we think set us apart at the beginning. Took me a long time to commit to that, in spite of myself almost. I agree about just writing and writing until we get through all our bad habits. So far as I can tell, it’s best to avoid becoming a workshop junkie—someone who’s always after writing advice but never sits down and writes. Also very true about the ‘self-indulgent tendencies we think set us apart at the beginning’—wow. That really is what it is! My first novel was written after I dropped out of college (we call it a college transfer, in retrospect) and that’s exactly what it was, self-indulgent junk that I thought was very clever, but was in fact only tedious. And plotless. I don’t even have that novel anymore, which is unfortunate. I think it might be on a floppy disk somewhere. Good luck to you, and yes, one step at a time! Thanks, Tina. I live in southern Maine, close enough to work in NH, and to be caught up in the vacation commuters tearing up I-95 from Memorial Day to Labor Day. I lost a novel, too. Ha! By way of floppy disc! And I agree about the need to be actually writing. Talking about it is a fun pastime for sure, but it has to be balanced with some time actually writing! I’ve not been in a group before other than an elective in college, and imagine it would be great fun, with a few moments of exasperation thrown in for good measure. Given the time in which I squeeze the actual writing, a group remains temporarily out of reach, but I enjoy feedback from folks like Hariod and others I’ve met here in WP land. All the feedback is helpful. I’ve visited southern Maine very briefly, I think I was just passing through. I recall all the tourist shops, but also some really nice towns. I lived in Brattleboro which has its share of tourists, mostly around foliage season. In my novel my characters definitely do represent different world views since each one is supposed to exemplify a segment on the Divided Line in Plato’s Republic—four levels of knowledge. Each of these makes up a worldview. I think Plato’s characters in the Republic do the same, so I modeled mine off of his, loosely. For instance, the first segment represents ‘picture-thinking’ and his corresponding character is a religious old man, not a deep or careful logician by any means, but inherently a good person. The next level is ‘belief’ and that character is the anti-Socrates, a Sophist whose ideas are very much like Nietzsche’s. So, violently against religion and convention, intelligent, but in a dangerous territory (according to Plato). The next level is ‘understanding’ and that character is actually Plato’s brother, a mathematician-musician, perhaps a Pythagorean (I’m going with Pythagorean since that’s a better story.) The final level is Socrates, who represents reason. To make a contemporary version of all this, I had to stretch the original world views to encompass our times, and to fit with my story which, unlike Plato’s dialogue, has a plot…I hope. The religious old man becomes a young female fundamentalist Christian college student who finds herself struggling to keep her faith on a very liberal college campus. Her character was the hardest for me to write, even though I grew up in the Bible belt. She just isn’t anything like me in any way. Honestly, I’m still not sure I’ve nailed her character, but people can sympathize with her as she is, so I’ll probably just leave it or do minor tweaks (I think she’s a bit too saucy sometimes.) The other characters are basically versions of me at different times in my life, and the mathematician is still a college student so I can get away with not being a math person to some degree. The exception is Socrates, who’s a philosophy professor and who must be a clearer, more logical thinker than I am. Well, that’s where my husband comes in (also a philosophy professor). So if he wouldn’t say it, my “Socrates” won’t say it either. Everything in his voice has to be really streamlined, because this character hates pedantry, preferring clear and simple language. My character isn’t really my husband or his voice, but when it comes to the ideas, I always run it by my husband to make sure it’s all in order. Do you do something similar with your characters? Do they have different world views or opposing positions? Your novel sounds really interesting. I find it can be difficult to discuss writing–and I think you’ll appreciate this–because our writing is about so much more than what happened. You could find out what happened by reading a news report, but that’s not what fiction writing is… It’s about word choices, sentence structures, tones of voice, dramatic movements, a moment of grace or of violence, what we show and what we don’t show, and what our characters reveal to us about the world. It’s sort of about revealing what is, in a new way. I bring this up because someone was nice enough to ask me about a story I’d written last night, and they asked the obvious question–like we would at a cocktail party–what’s it about? That’s the analogous question to: So, what do you do? And of course what we do and who we are tend to be related but are not really of the same order of phenomena. Explaining what we do is very watered-down and dry when who we are is absent from the discussion. I’ve been lately trying not to have characters represent particular worldviews, although the stories of course have a particular perspective as a whole. But I’ve really been trying to shy away from making too many overt points in my stories, and to capture the essence of a character, or an insightful or revelatory moment instead. If they have a point, I hope it is a point that can only be said in the particular confluence of characters and moments that have emerged on the page, and not reduced to a basic proposition or injunction. My previous effort–the bad one, at least in terms of its viability in terms of a general audience–was an allegorical tale of a character’s philosophical/spiritual journey, in which a narrator was guided through various trials and tribulations and moments of discovery and of falling in love by the Sufi poet Hafiz. I know what you mean by the question, “What’s it about?” The dreaded question. I’ve been thinking about my ‘elevator tag line’ for my novel, but it’s so hard to cut it down to a manageable size. How do you capture the essence of your novel in a sentence? Is it possible? Maybe, but I haven’t figured it out yet. As for having a point, I agree that the best thing is when this emerges through the confluence of characters and isn’t reduced to a proposition. Otherwise you might as well have written non-fiction. I tend not to have difficulty in getting detailed and particular with my characters and stories—for me the problem is unity and coherence. I can box my characters up all day and they’ll still find a way to escape their boxes, but if I don’t box…well, chaos ensues. Same goes for plot. “Now I’m waiting for the group to meet again in July to do a critique on the whole thing, beginning to end, and I have to admit I’m nervous.” – Terrifying stuff to Esme is that, as is the dancing in public for a performance and white water rafting. The writer’s group response will be, I am quite sure incredibly useful, and not at all humiliating, it is your fear of the potential that’s getting a grip there. My fear of said potential has me not going anywhere near a writer’s group in a million years, indeed it’s been a long and rough road to get the point where I have my work proofed and read back all the ‘suggestions’ and gasp at the reams of highlighted mistakes grammar-wise. Writing for the public to read IS frightening, but incredibly rewarding too I have found. I know what you mean about Mrs Dalloway, I am half-way through now and on the one hand it is beautiful writing, but on the other the plot is lost by the amount of ‘ooh-ing and ahh-ing’ taken up by the clever text. For it’s time ’tis a wonder mind and I would read more by her, but in no way does it make me want to dive into it as my most beloved tomes have always done. You have been busy Tina! I’m glad, it sounds like you’ve had fun. Scary fun, but good on you. And as to my most risky endeavour? For the moment I’ll go with the week afore last when I posted a poem about a terrible tragedy in the UK. Those I showed it to pushed me and pushed me to make it public beyond WP, beyond ‘Esme’s Cloud’ and so I allowed two worlds that never meet to overlap briefly. This meant that many people who know me on a daily basis and had no idea that I write at all came to the Cloud and later gave their responses on the book of faces. It was horrifying to me as I am a rather shy Cloud dancer but it all was received fantastically, better than I could ever have hoped for, so was a risk worth taking. Had it all gone pear shaped and people have said it was in bad taste and badly written I would have died a thousand deaths. Thankfully here I am, not dead at all. *twirls*. I’m not showing them anything else mind you. Great post Tina, with interesting comments as ever. The book of faces! I love it. I think I’ll be calling it that from now on. And I definitely know what you mean about criss-crossing these worlds. I’m always shocked when a real life face friend actually reads my blog post. I have the blog linked to the BOF, but I don’t expect anyone from there to come here. I have to admit I’m very lucky with my writer’s group because we’re all so well-trained on this critiquing stuff, thanks to our having taken the same wonderful class. And we’ve been together for years now, and time in itself can build a great deal of trust. If you ever decide you want a group, I’d highly recommend cherry picking your favorite readers-writers from a class. It was a little rocky in the beginning, but that was only because others from the class had heard about our little group forming and that made things awkward when they didn’t get invited (well, when I didn’t invite them). Other than that it’s been pretty smooth sailing since we never had to settle on rules of operation. We just took the ones we’d been using in class and things went evolved organically. (We dropped the rule about forbidding plot suggestions. We all decided that we’d love to have those—to hell with the sacred creative process.) All in all, yes, very rewarding. I can’t imagine not having a group, actually. On Mrs. Dalloway, I found myself mostly too confused about POV to enjoy the writing, and the lack of plot made me lazy about teasing things out. But I understand that style hadn’t been around then, the way it has now. So I guess I appreciate it in that sense. I will have to come and check out your poem! I hope you weren’t anywhere near any of these things I’ve been hearing about on the news? I don’t go to any classes to pick any writers, ideally I’d choose people from WP hahahaha — not so easy eh? I’m toddling along though well enough I think, and have some friends who read through my work and give opinions. Poetry is much easier mind you as you can write anything and insist it’s absolutely right *laughs a lot*. Mrs Dalloway, yes, lost the plot she did and isn’t holding onto me very well, but in small chunks quite brilliant. It’s just that the chunks don’t sit together all that well. Poetry easier to write? Well, not for me! I find it terrifying, to be honest. Even reading it can be terrifying. The only poetry I’ve written is through the POV of one of my characters, and it’s goofy stuff. Oh noooooo, not easier to write, easier to take or deny criticism of, much like abstract art compared to your conventional Moaning Lisa. I know what I am mind you, I am a poet, and have been since I was a wee child, not a novel writer, not a short story writer, anything in that area is very much a dabble, and far more stressful, but useful too. People have different elements of ability when it comes to creation, but I also think many just don’t have the confidence to try poetry too much for fear of being rubbish. Someone I know well thought just that, and I suggested he write a poem anyway, and need not show it anyone, just write it. See what happens. He showed it me of course hahahaha, and it was really very good, but he didn’t know because it was out of his sphere of comfyness, alien territory. Practice makes a big difference, but ultimately people write and love what appears do what their heart tells them to far more than their heads I think. I love poetry, and I know it does come easier to me than for some others, but I push on with my short stories anyway, push at the comfy boundaries man *smiles*. I have around thirty short stories that range from a few paragraphs to thirteen thousand words and none of them are finished. They will be one day. Of course I have finished some, they’re going in the book, but it’s mostly poetry. An online virtual writing group sounds fun. Depending on who is in it. Hahahaha. I’m glad you’ve met Michael, he’s a fine writer, and a lovely chap, he bought some of my artwork and supports my writing endeavours wonderfully. We’re all like little atoms drifting together on WP, forming a big creature that will take over the universe. Not the last bit. Hahahaha. I think the main reason I don’t write poetry is because I don’t read it. Excepting the stuff we had to read in high school, I generally just don’t get the more contemporary stuff, unless it’s funny or light. Way over my head. But you’re right in that it’s good to get in over your head, and poetry teaches economy and streamlining in a way not even short stories can touch. In the few poems I wrote for my novel (via a character POV) I found out just how difficult that is. I spent forever on each word and found that once you tweak one part, everything else has to be tweaked, and it gets insane really fast. Hours and hours and hours on less than a page, and even so, at the end of it all I wonder if I said what I meant to say. I’m glad I’ve met Michael too and I look forward to reading his posts. There’s nothing like having a writing community, that’s for sure! As for forming a big creature that will take over the universe…that reminds me of my new kombucha-brewing hobby. Have you ever seen a SCOBY (symbiotic culture of bacteria and yeast)? It looks like a brain in a vat. I can’t believe I enjoy drinking the liquid it lives in. And it grows, taking up as much space as you give it, and produces babies in creepy, slimy layers. Anyway, that was the image that popped into my head when you spoke of “drifting together…forming a big creature”…a symbiotic culture of writers and artists. “I spent forever on each word and found that once you tweak one part, everything else has to be tweaked, and it gets insane really fast. Hours and hours and hours on less than a page, and even so, at the end of it all I wonder if I said what I meant to say.” – Welcome to my world. Hahahahaha. Only instead of being tiny it would be unfeasibly enormous. 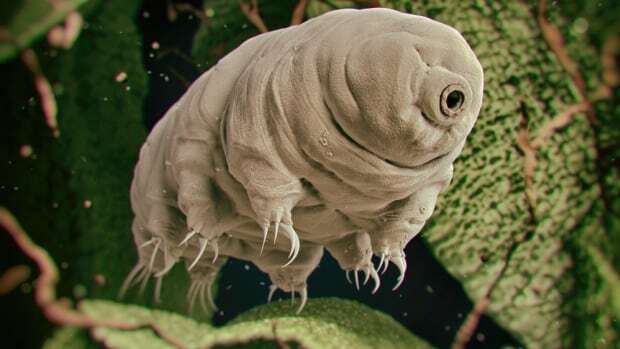 Tardigrade’s: bloody hell, they’re amazing, one of the few species to have survived the five mass extinctions that earth has faced, and the first animal known to survive in space, plus they can withstand 1,000 times more radiation than all other animals. I’d be careful if I was you Tina. She’s only just been let out after the last frenzied attack. What a mess — severed limbs everywhere apparently. Well, I’m sure Geordie will protect me…by licking her knee and wagging his tail until her heart melts into a goo-ball. Damnit, would you stop writing such deep, thoughtful posts? This one, too, I have to really think about… so much content here! To quickly answer your final question(s): Do love risk taking and find it meaningful. Skydiving was likely the riskiest physical thing. Not sure what the riskiest social thing was… getting married maybe? Good thing the skydiving didn’t turn out that bad. Skydiving is beyond risky for me. I would have to feel suicidal…even then, I’d probably choose some other means. And this true risk is exactly why skydivers love it so much. Kinda ruins you for rollercoasters and such, though. They seem a bit dull given all the safety measures. The actual risk is vanishingly small. More importantly, kudos to you for your accomplishments in dance, and I’m glad to read above that you’ve been feeling better!! I was wondering about that just the other day. I listen to Kill Tony, a comedy podcast that gives people 1 minute to do stand up, they can be a pro, or some crazy person that just decided to enter their name in the bucket, then, after their minute of stand up, they get roasted by the board of professional comedians. The lesson I learned from them, that is also true in writing, is that the writing has to be personal, it has to come from your life, those are the funniest jokes, those are the most profound.stories. Good luck with your novel. It looks as though we share a similar goal in what we are writing. Thanks for commenting! And yes, it looks like we both have the philosophy and fiction bug. There aren’t too many of us! Dionysian character vs. Apollonian? That would make for some serious tension! It’s funny, just today I’ve been working on a chapter in which two characters are similarly opposed. Actually, now that I think of it, I tend to use that as a model, though not always explicitly. Good point about comedy and taking personal risks. Especially since so much of that is about expressing opinions or thoughts, often taboo ones. Good luck to you too, and happy writing!